I ordered some "boy" fabric last week but due to a mishap haven't received it yet. I did find some green striped cloth in a shop that I thought would make for some nifty boyish pants. I think I'll sew up a pair so you can see what I'm talking about and hopefully I will get a better photo! The fabric really is much nicer in person than in the picture below. 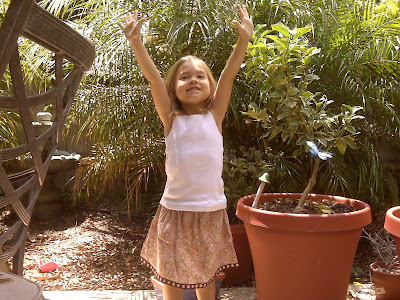 Also, I got a lovely picture of Kaia wearing her Sassy skirt! Thanks again, Michele. I love getting photos. Sydney is becoming more and more a moving target and trying to get a decent picture of her is quite the undertaking. Anyways, I still have some of this paisley fabric left and will list another skirt like this in the shop.